I spoke too soon. 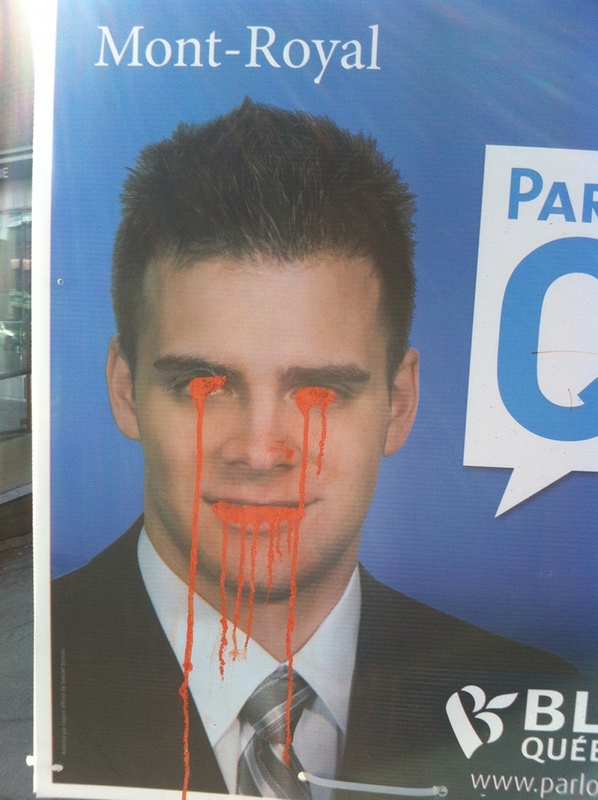 Some Bloc campaign posters have been vandalised. Just not the ones of Duceppe on my street. I like the drippy orange blood effect. I wonder if the orange spray-paint is meant to indicate that the person defacing the poster was a supporter of the NDP? After all, the NDP is supposed to be really popular in Québec these days. I went out for dinner of Friday night, and saw this campaign poster in front of the restaurant. 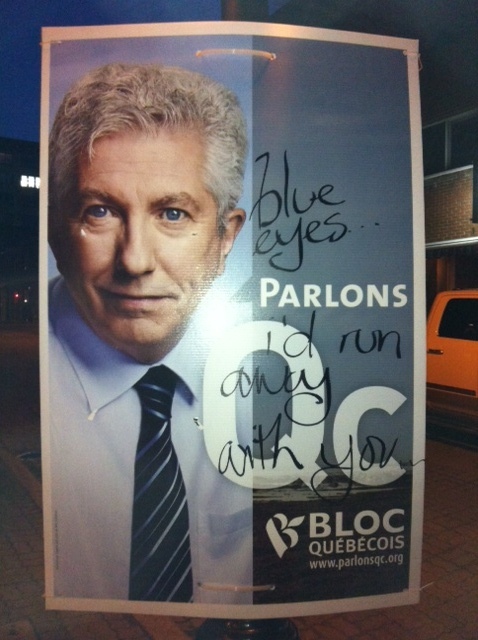 This is the first time that I ever saw a Duceppe poster vandalised. The vandalism says, “blue eyes … i’d run away with you” in English. 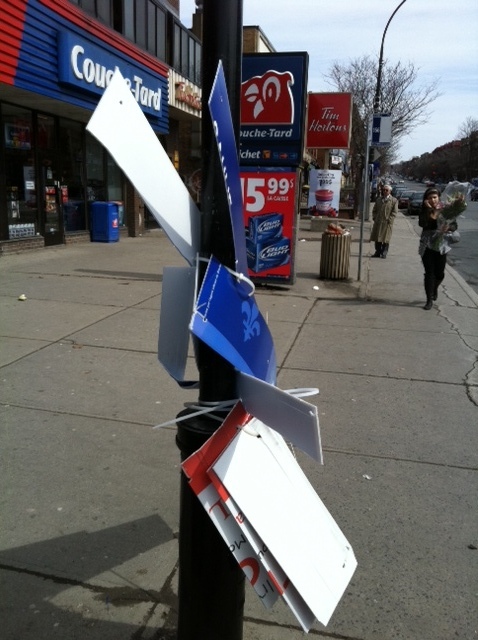 The campaign signs in my neighbourhood have not been faring well lately. It looks like both the Conservative and the Liberal signs were very thoroughly destroyed recently. Not surprisingly, across the street, the signs for the Bloc have not been touched. 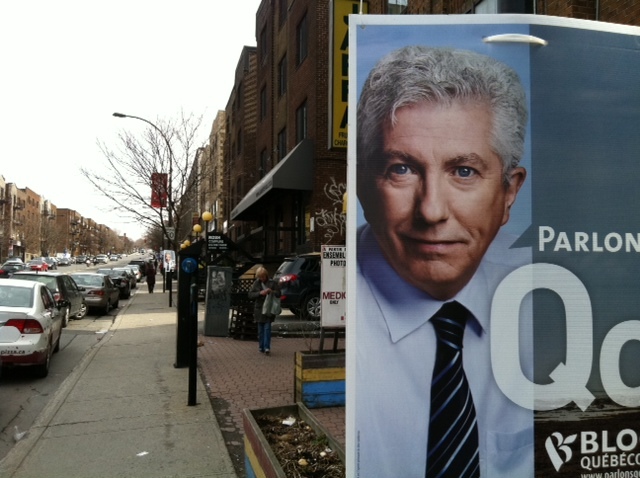 I would be scared of Duceppe too. If you look close in the photograph of the sign for the Bloc, you can see another Duceppe sign maybe 20 metres down the street. There’s lots of them and they haven’t been torn apart. I have a policy of never telling anyone who I vote for. That said, here is the result I got on the Vote Compass. It’s a fun and enlightening tool—one that would be a helpful starting-place for people who don’t follow Canadian politics very closely, but who still want to be responsible citizens and cast an informed ballot. 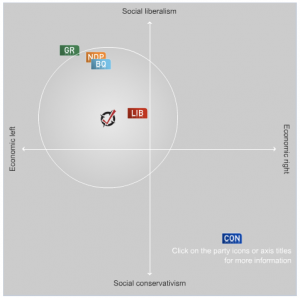 You tell it what you think about a few political issues, and then it tells you where you are on the economic and social political spectra, and which parties are closest to you. You can even indicate which issues are important to you, and then it adjusts the picture to compensate! I’m surprised that I’m not further to the economic left, to be honest. I’m looking forward to Democracy Day, which I’m told has been scheduled for May 2. My favourite part of elections are the personal, petty attacks on party leaders’ character. Why, I remember the provincial election back in 2003 when I was a student at UWO. There was a press release from the PC party of Ontario, calling Dalton McGuinty an “evil reptilian kitten-eater from another planet.” I hope that something like that happens again. Politics can be so much fun when people who should know better do things like that.